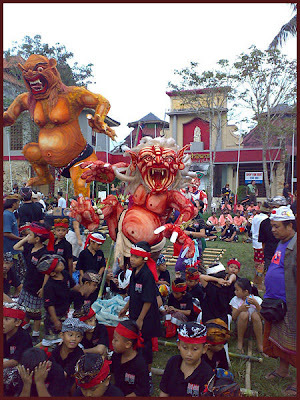 Nyepi is a Balinese "Day of Silence"
that is commemorated every Isaawarsa (Saka new year) according to the Balinese calendar (in 2012, it falls on March 23rd). It is a day of silence, fasting, and meditation. 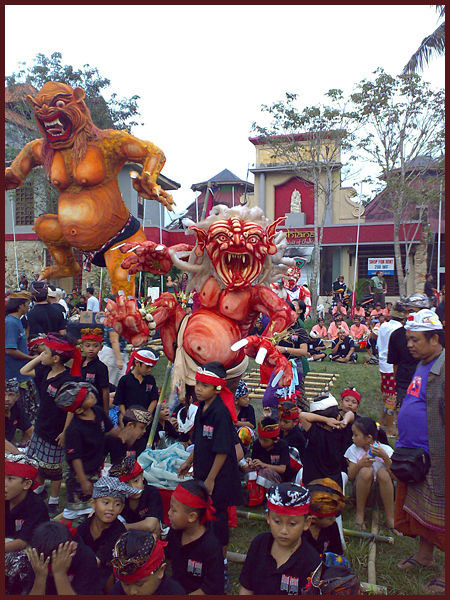 The day following Nyepi is also celebrated as New year. Observed from 6 a.m. until 6 a.m. the next morning, Nyepi is a day reserved for self-reflection and as such, anything that might interfere with that purpose is restricted. The main restrictions are: no lighting fires (and lights must be kept low); no working; no entertainment or pleasure; no traveling; and for some, no talking or eating at all. The effect of these prohibitions is that Bali’s usually bustling streets and roads are empty, there is little or no noise from TVs and radios, and few signs of activity are seen even inside homes. The only people to be seen outdoors are the Pecalang, traditional security men who patrol the streets to ensure the prohibitions are being followed. 2012 is the Balinese Year 1934.